OVERALL IMPRESSION: The beginning was a little bit slow moving, but about 60 pages in, it picks up and starts to get interesting. This was cute, and a really good example of the perfect contemporary read. 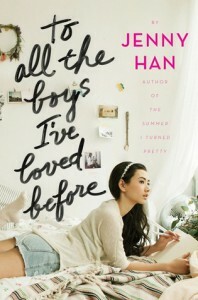 I was expecting it to delve more into each of the letters and maybe go on to explain more about each of the boys that Lara Jean felt she was in love with, but this is more about what Lara Jean does after she discovers the letters have been sent out and doesn't really have a whole lot to do with the letters themselves. CHARACTERS: I can really relate to the main character, Lara Jean. On page 32, she talks about her fear of driving, and it sounds exactly like me. She's also into scrapbooking, which I love as well. I loved the relationship between Lara Jean, Kitty and Margo. It is the exact relationship that I would want if I had sisters. COVER: I like the cover. I like the glimpse into Lara Jean's room and I like the handwritten font of the title.